The next big trend in health food is always right around the corner. One minute, yoga mat toting health nuts are all-in on coconut oil. The next? Experts suggest that it may not be as healthy as we all thought, and it’s onto the next trend. But there’s seemingly no shortage of interesting, untapped gems in the world of health food. New foods are being touted as “superfoods” all the time -- and, indeed, many do boast some impressive health benefits. While not every food can be officially categorized as a superfood, several new trends in health food are packing a big nutritional punch. So what new health food trends has 2016 brought us so far? For those who enjoy a low calorie way to drink their way to good health, birch water may be just the ticket. As its name suggests, this beverage is made from birch tree sap. But don’t worry; buying birch water doesn’t mean you’re signing up to down a container of maple syrup. The drink is actually tea-like in consistency. Like coconut water, the sweet, piney tasting elixir is low in both sugar and calories. It also contains saponins (which may lower cholesterol) and xylitol (which can help fight tooth decay). The liquid in which canned chickpeas float prior to being dumped into a strainer can be used as a replacement for egg whites, vegans recently discovered. The name “Aquafaba” is derived from the latin words for “water” and “beans.” When whipped, researchers discovered that the viscous water surrounding legumes, such as white beans and chick peas, thickens and can become an egg replacement in recipes. Aquafaba is well-suited to vegan diets or those of people with ethical or religious reasons to avoid eggs. But while the trend has been met with enthusiasm, little is known about Aquafaba’s nutritional content. According to an analysis on Aquafaba.com, the liquid contains about a tenth of the protein of egg whites. Plant based proteins have stepped squarely into the spotlight this year as consumers become more conscious of the environmental impact of their food. Now, insects may be stepping up (perhaps involuntarily) to satisfy humans’ protein requirements. Insects, such as crickets, are being used as ingredients in snack foods and other recipes. 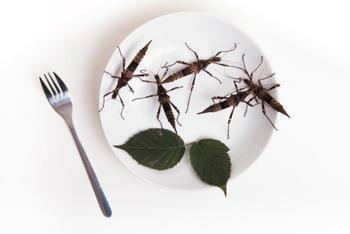 Experts even go so far as to say that insects are the future of food. What’s in it for those who choose to incorporate insects into their diet (a practice known as entomaphagy)? Protein, for one. And opting for bug-based protein is much kinder to the earth, as insects require minimal water and feed.